Known test pressings of the black vinyl have white labels and test pressings of the blue vinyl have white labels or strawberry labels. In January 2005 a blue vinyl copy was sold on Ebay which had a sticker on the back cover stating "Factory sample - not for sale". This copy however had ordinary Bronze labels. The problem with test pressings with ordinary labels are that they look exactley the same as stock copies. So even if they were test pressings there is no way for you to check if they really are. I have no information about any special promo versions of the UK BRON 523 edition which is a bit odd since Bronze usually distributed promo editions of their releases. I have seen copies with golden promo stamps on the sleeve of the Overkill album. A copy was sold on Ebay in August 2006 described as "promo copy with green blank labels, no text". Probably a test pressing used for promotion. This copy was described as "an item that used to belong to a roadie of the band" and was originally housed in a plain white card sleeve, but a standard picture cover was added later for identification purposes. I am pretty sure this copy actually was sold by the con artist bluepyevinnie (see here for more information) but at the time I did not document who sold it or who bought it. The reason I think it was bluepyevinnie is because a year later he sold a fake green label copy to me. He claimed that copies with green labels came direct from the pressing plant, not through the record company. 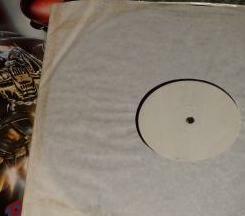 Already in June 2007 bluepyevinnie sold a test pressing of Bomber with white labels on Ebay. Probably a fake too but I can´t be 100 % sure of course. This had plain white labels and was housed in a plain white inner sheet but bluepyevinnie had added a standard stock sleeve. That is what he claimed. I was bidding on it but lost. Later he offered me a second chance because he said he had one more copy. How likely is that? The Bronze EMI releases were pressed by Hayes pressing plant for EMI at Middlesex near London. A copy with a sticker on back saying "Factory sample - not for sale" but with an ordinary sleeve and ordinary labels, was sold for GBP 20.50 on Ebay in January 2005. The one with green labels was sold for GBP 75 with buy it now on Ebay, August 2006. In June 2007 bluepyevinnie sold a copy with compeltely white labels for GBP 106.